Before limiting yourself to local selection – or potentially overpaying your used Lexus in Kitchener, take a look at the used Lexus specials at Lexus of London. Here at Canada’s #1 Lexus dealer by DealerRater.com reviews, we believe that we excel over our competition in several ways, and are the best choice for any shopper seeking a used Lexus near Kitchener. We believe that Lexus of London is the superior used Lexus dealer near Kitchener for a variety of reasons, including the breadth of our inventory of used Lexus near Kitchener, our exclusive Executive Demo Lexus inventory offerings, and finally our aggressive used Lexus specials – combined, these three factors show Lexus of London as the clear winner and your best option for a used Lexus in Kitchener. 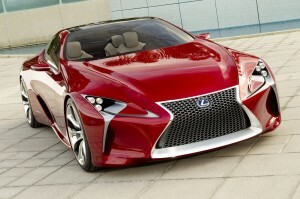 Simply put, when it comes to breadth of inventory, no one can beat Lexus of London. Whether you’re searching for a 2011 Lexus in Kitchener, 2012 Lexus in Kitchener, or 2013 Lexus in Kitchener, you’ll find more options here at Lexus of London than at any used car dealer near Kitchener. Plus, at Lexus of London, you have the benefit of buying Lexus Certified Used vehicles – these exceptional used Lexus vehicles near Kitchener are not only held to very high standards and completely reconditioned by our factory-trained Lexus technicians, but they include a warranty rivaling that of a new Lexus in Kitchener. If you’re looking for the most reliable way to buy a used Lexus near Kitchener, choose Lexus Certified Pre-Owned at Lexus of London. Lexus of London is also the only Lexus dealer near Kitchener to offer the exclusive complete benefits of executive demo Lexus vehicles – these are lightly-driven, like-new vehicles that have been used by corporate executives at Lexus Canada and Lexus of London. Once finished with their assignment as a Lexus representative’s vehicle, they return to our Lexus dealership, where we then offer them to you for a fraction of the cost of a new Lexus in London. This makes executive demos a type of used Lexus near Kitchener that truly rivals many of the brand new Lexus options you’ll see at other dealerships. Why, exactly? Because our executive demos are current model-year Lexus vehicles with low kilometres available, and they’re available at significantly reduced prices compared to their new counterparts. Contact us here for more. 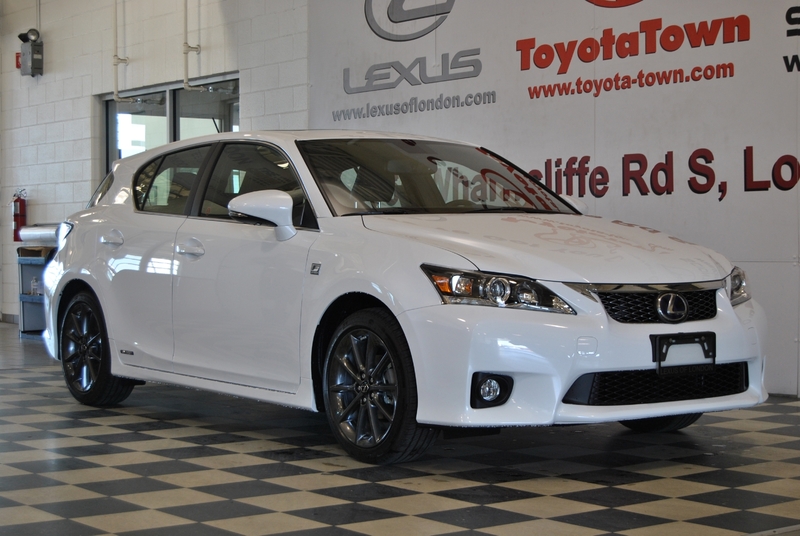 Lexus of London features a number of used vehicles on our Pre-Owned Specials page. Here, you’ll be able to find used Lexus specials at much lower prices than you’ll find at other Lexus dealers near Kitchener. Find 2011 Lexus Specials near Kitchener, unbeatable pricing on a 2012 Lexus near Kitchener, and even great deals on vehicles as recent as a 2013 Lexus in Kitchener here at Lexus of London’s used Lexus specials feature. Ready to Purchase Your Next Used Lexus in Kitchener? We hope by now you can see that when it comes to dependability, transparency, expertise, and great used Lexus specials near Kitchener, Lexus of London is the premier used Lexus dealership in Ontario, and the #1 Lexus dealership in Canada according to DealerRater.com. We treat our used cars with the same care and professionalism as our new cars, so we can deliver the same superior experience with a used luxury vehicle in London as you’re accustomed to finding in a brand new Lexus. Here at Lexus of London, we’re proud of our two decade-plus track record of satisfied customers, and of the fact we’re the only Lexus dealer in London where you’ll find the most knowledgeable staff and the best used Lexus specials in Kitchener — allowing you more options than anyone else to drive home your next Lexus for less, today. Check out our used Lexus specials online, then contact us online or call us at 1 (888) 691-8453 to arrange a test drive. Looking for a 2011 or 2012 Lexus in Sarnia or Kitchener and want to be sure you’re getting the best Lexus for your time and money? Here at Lexus of London, we pride ourselves on bringing you the best used 2012 or 2011 Lexus in Kitchener or Sarnia with the lowest price and finest customer service you’ll get anywhere. Here at our impressive dealership facilities, you’ll find an expansive selection of used Lexus vehicles, unbeatable used Lexus specials, and the peace of mind that comes from selecting your next luxury vehicle with help from our team of professional Lexus experts. When you’re shopping for a used Lexus in Sarnia, Ontario, or hopelessly searching car lots for the perfect used Lexus in Kitchener, stop spinning your wheels and visit the premier used Lexus dealership in London, ON instead. Not only does Lexus of London have the distinction of being Canada’s #1 Lexus dealer according to DealerRater.com, we also stock only used Lexus vehicles that are personally inspected and serviced by our team of certified Lexus Service professionals. Our team of specially-trained Lexus technicians knows your 2011 or 2012 Lexus in Sarnia or Kitchener inside and out, so when you drive your 2011 or 2012 used Lexus home, you can be sure that the utmost care has been taken to ensure that your used Lexus performs as much like a brand new Lexus as is possible. It’s highly important to us that you drive home in the best used car you can buy, because we understand that although it’s technically a used Lexus, it’s a new Lexus to you. Ready to Purchase Your 2012 or 2011 Lexus in Sarnia or Kitchener? 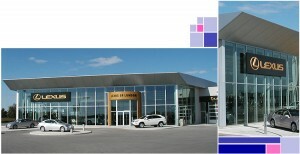 When it comes to choosing the best 2011 or 2012 Lexus in Sarnia or Kitchener, Lexus of London is worth your time. We’re the premier used Lexus dealership in Ontario, and DealerRater’s #1 Lexus Dealer in Canada by customer reviews. We treat our used cars with the same care and professionalism as our new cars, so we can deliver the same superior experience with a used luxury vehicle in London as you’re accustomed to finding in a brand new Lexus. View our used Lexus specials, then contact us online or call 1 (888) 691-8453 to arrange a test drive. Part of being the premier Lexus Dealership serving London, Kitchener, Sarnia, Windsor, St. Thomas, Brantford, Waterloo, and Mississauga is providing our customers with the best possible technology to shop for a new Lexus in Kitchener, Sarnia, or Windsor. Likewise, our team is perfectly equipped to help you find Used Lexus Vehicles in London, Lexus Maintenance in London, or one of our exclusive inventory of Executive Demo Lexus in London. That’s why we’re pleased to announce the unveiling the all-new LexusofLondon.com website, illustrating our commitment to continuos improvement of our ability to serve our valued, loyal customers. One goal of the all-new LexusofLondon.com was to help our customers browse, select, and receive more details on a new 2014 Lexus in London, used Lexus in London, or Executive Demo Lexus in London. As such, we’ve simplified our inventory navigation to make it easier than ever to find exactly the right Lexus for your needs. Searching for used cars in London, Ontario? Our Pre-Owned inventory listings, and our new and improved Lexus Specials area make discovering savings on your next used Lexus in London easier than ever. Just as we’re always keeping the Lexus of London Service Department equipped with the latest tools to bring you the finest Lexus maintenance in London, Kitchener, Sarnia, or Windsor, our website’s Service page is current with modern standards as well. Here, you’ll be able to easily browse Service specials, and if you need to schedule a visit, our improved appointment scheduling system makes it easier than ever to secure an appointment and for your cars to reach our Service bays from the comfort of your computer. 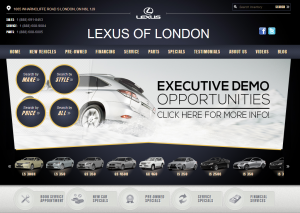 A Premier Website for London’s Premier Lexus Dealership: Visit LexusofLondon.com Today! Here at Lexus of London, we’re extremely proud of the improvements we’ve made to our website, and we want your experience of browsing the all-new Lexus of London website to be as natural and welcoming as your actual in-store experience here at our beautiful Lexus dealership in London. Just as our friendly and professional sales staff help you effortlessly find the new or used Lexus car you’re looking for — or help you discover our selection of Executive Demo Lexus cars in London — our new and improved website is designed to be a friendly, intuitive, and seamless car shopping experience. We invite you to become acquainted with our new website at LexusofLondon.com, and then contact us to learn more about how we’re changing the way luxury car dealerships in London take care of their customers. Have questions or feedback about our new website? Contact us online or call 1 (888) 691-8453 to let us know. Looking to Buy a Used Lexus in London, Kitchener, Windsor or Guelph? Are you looking high and low for a use Lexus car in London? Whether you’re shopping for a used Lexus in Kitchener, London, Windsor, St. Thomas, Guelph, Waterloo, or Sarnia, you want to know that you’re getting the best used Lexus for your hard-earned dollar. That’s where Lexus of London’s excellent selection comes in. Our inventory includes not only a wide selection of used and Certified Used Lexus cars in London, but we’re also the home of Executive Demo Lexus cars in London. Unlike shopping for used cars in the local classifieds, Certified used Lexus cars in London go through a rigourous process of reconditioning to ensure that you drive home in a used Lexus that will stand toe-to-toe with any new model on the roads of London, Guelph, Kitchener, or Windsor. What is an Executive Demo Lexus, and How does One Help Me Save on Used Cars in London? Our Executive Demo inventory is a unique segment of London luxury used cars available at Lexus of London. An Executive Demo Lexus is a very lightly-used, new model year Lexus car that is driven a fraction of the distance of a typical used car. It’s then sold at a noticeable discount to other new model year Lexus vehicles in London. When you buy or lease an Executive Demo Lexus in Windsor, Kitchener, or Sarnia from us, you’re getting a used Lexus in London that is as close to new as you can find. This not only delivers the substantial benefit of paying significantly below the new Lexus MSRP, but also the peace of mind in knowing your pre-owned Lexus will deliver like-new reliability. An Executive Demo Lexus near Windsor, Sarnia, or Kitchener found at our Lexus of London showroom will also be in very good condition due to their limited use. This means you won’t experience the typical wear and tear you find in many London luxury used cars. Ready to Purchase Your Next Used, Certified Used, or Executive Demo Lexus in London? Whether you’re looking for a used car, Certified used Lexus, or Executive Demo Lexus, Lexus of London is the premier used Lexus dealership in Ontario. We treat our used cars with the same care and professionalism as our new cars, so we can deliver the same superior experience with a used luxury vehicle in London as you’re accustomed to finding in a brand new Lexus. Plus, our unique inventory option of Executive Demo cars helps us deliver the best of both worlds: new model year vehicles with the latest amenities, with great new car warranties in-tact, in great condition and with low KMs — all at a price more in line with London Luxury used cars than new Lexus vehicles in London. 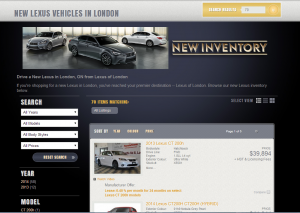 Why Choose our London, ON Car Dealership? What Makes Lexus of London the Best London, ON Car Dealership? If you’re shopping for a new car in London, Kitchener, Windsor, or St. Thomas, you have no shortage of options. However, choosing the best car dealership in London for your unique needs can be a challenge. Nearly every London, ON car dealership claims to be the best, the brightest, the cleanest, the most honest, the friendliest, and the most popular – but which of these claims are actually valid, and which aren’t? Here at Lexus of London, we let our reputation for excellence speak for itself. To find the supporting information you need to make Lexus of London your ultimate car buying destination, consider the below information. Here at our Lexus car dealership in London, you’ll find nothing less than the widest selection of new and used Lexus vehicles near London. This means that Lexus of London, you’ll find the entire lineup of 2013 and 2014 new Lexus vehicles for you to drive home. Our inventory also has the special distinction of including Executive Demo Lexus cars. An Executive Demo car is originally a new model year Lexus that is lightly used by our management, and then returned to our showroom with very low kilometres and little to no wear and tear. Our Executive Demo program results in price tags that are a fraction of what you’ll pay for that same model year Lexus in London if you purchased it new, as opposed to as a very lightly driven, low KM used car. Our new and used inventory, together with our special Lexus Executive Demo collection, make us the pre-eminent London, ON car dealership when it comes to variety and quality of in-stock vehicles. Once you’ve purchased or leased a Lexus in London, you’re going to want to make sure you protect your vehicle so it stays on the road as long as possible. At Lexus of London, our facilities include modern, well-equipped Service and Parts Departments designed specifically to help you achieve that goal. When you visit us for Lexus Service in London, you’ll be working closely with our staff of highly-trained Lexus Service Advisors and Certified Technicians. Lexus of London Service is an Authorised Lexus Service center, which that means no one knows — or can serve — your Lexus vehicle better than our team of knowledgeable, factory-accredited Lexus Service professionals. 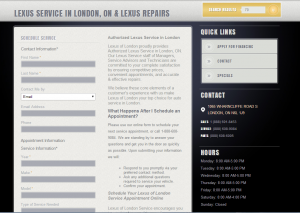 When we repair your Lexus in London, our Lexus Technicians use only Lexus Genuine Parts. This means you’re getting parts that are specifically engineered for your particular Lexus — unlike the generic aftermarket parts you’ll find at some other service centers near London, Kitchener, Windsor, St. Thomas. So, whether you need Lexus Parts in London, Lexus Service near Kitchener, or both – Lexus of London is both prepared and qualified to meet your needs. Since our opening in 1991, our Lexus car dealership in London has dedicated ourself to the Pursuit of Perfection. In our view, this constant dedication to improvement and excellence isn’t just a mantra – it’s our version of business-as-usual. That’s one reason why we’ve earned and maintained ISO9000:2001 status. ISO9000:2001 is an internationally-recognised certification that in its simplest terms, means Lexus of London is unequivocally committed to pursuing customer satisfaction. “I live in Toronto and was in the market for a new Lexus. I began looking outside the Toronto area for a few reasons including my local dealership wouldn’t respond to my initial e-mail offer other than to tell me it was too low and if I wanted to buy a car from them, I would have to go to the dealership to negotiate the price. Hmm… I thought – strange strategy. Soon thereafter, I got in touch with Lexus of London via e-mail and received an incredibly polite, professional and welcoming e-mail from Stephanie. Part of what she wrote included “More and more of our guests are choosing to shop on-line for their new vehicle and it is my job to make things easy.” WOW!! What a welcoming change from the Toronto ‘attitude’. Don’t wait another day to visit London, ON car dealership. Visit our website, contact us online, or call 1 (888) 691-8453 to experience a commitment to your utmost satisfaction at Lexus of London for yourself.